A young man my son went to high school with is in Bethesda MD struggling to regain his life after losing both legs and one arm in Iraq. I have been working on a quilt for him and I just finished piecing the top. I have attached a picture I took with my camera phone. I hope the picture shows up good enough for you all to see it. Here is a link to his story if you are interested. It's a wonderful quilt and idea. Well done! It's a beautiful quilt. Is there a meaning behind the music fabric you included? 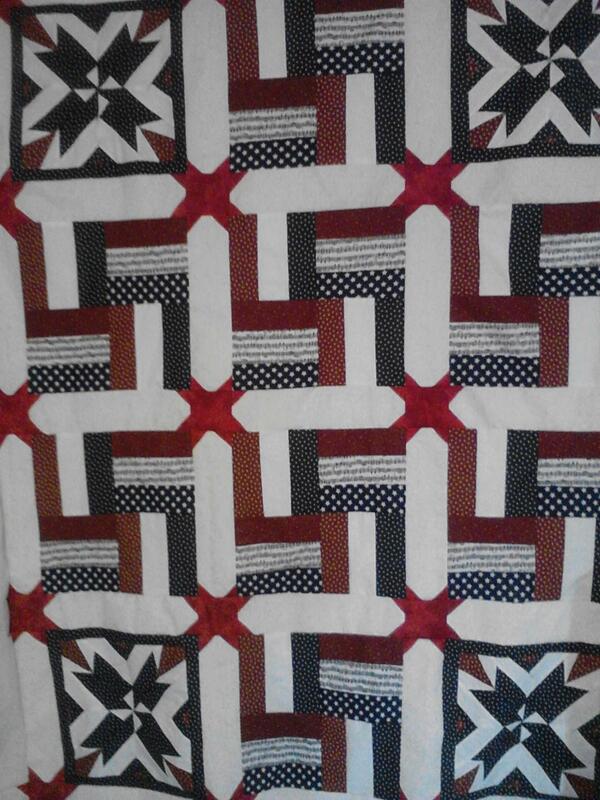 This is one of the nicest patriotic quilts I've seen. He will appreciate it. Thank him from all of us for his effort in preserving our freedom. He is wrapped in love. That is a beautiful quilt, but my heart aches for the young man. I included the music because it is an important part of the military. Everything from the simple bugles that were use for battle calls during civil war times, up to modern times. Music is used in military command events, there is a military band in every branch of the service, and then there is the taps that is played at every military honours funeral. So I just thought that music was just a very fitting piece to include. Absolutely beautiful, pattern is too. You have a beautiful heart to make this for him. I am so sad for his injuries, I so appreciate him serving our great and wonderful country. I know your quilt will bring him comfort. Absolutely wonderful gift, thank you for thinking about our returning vets. Wonderful quilt for a wonderful young man!!!! You did a fine job with this. It is a shame that so many of our best have been so badly injured and that we the people are doing so little for them. I am very happy to see this fine quilt. The quilt is lovely and so are you; this story made me weep, poor lad, why do we have to have war ,especially this one. The quilt that you made for him is absolutely gorgeous. I am a "softie" for ANYTHING red/white/blue...patriotic. And what a beautiful gesture on your part to make and give this quilt to one of our disabled vets. Beautiful quilt and it will be well appreciated. Great patriotic look. The quilt is beautiful and so are you for making it for him! I checked out his FB page and lost it. What our military goes through for our freedom we could never repay. Our 21 year old grandson is in the Army and getting ready to leave next week for his second tour of duty in Afghanistan. We will be storming the heavens with prayer for him and his fellow soldiers. Last time his 2 best friends were killed. This will be wonderful for him. More of us should do things for our returning vets. What a thoughtful and beautiful quilt! How stunning! You did a very nice job.